Sk2: SK2 - Week 4 Updates! Language Arts: We reviewed and practiced tracing letters "L" to "V." Also, "All about Me, Tee" posters are displayed in the hallway near SK2. Math: We reviewed, practiced, traced and printed numbers "4" to "6". 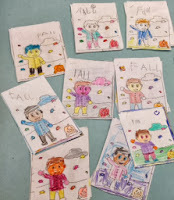 Science: In Science, first we watched a movie related to the four seasons and discussed it as a class. 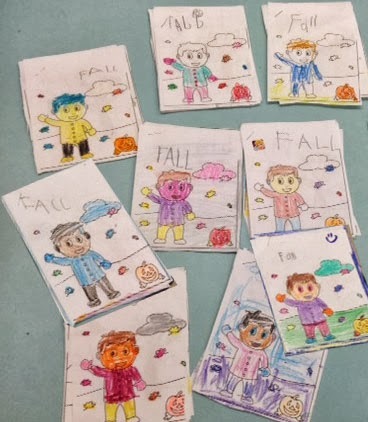 Then, students made their mini booklet on four seasons. Islamic Studies: Alhamdo-lillah , we are practicing and memorizing our classroom motto from Surah Taha (verse 25), as an opening dua in circle time everyday. We also started to practice a beautiful Nasheed "I am a Muslim, the things I say...Alhamdo-lillah". Please help your child practice at home as well. We started learning about Hajj by reading a book "The builders of the Kabah". We will be doing more activities regarding Hajj in the upcoming days insha-Allah. Visual Arts: We coloured, glued and cut different shapes. Then, we put it together in a form of a person. It showed me how my students use their fine motor skills, their art concepts, and how they follow simple directions regarding visual arts. Masha-Allah, students had lots of fun in this activity.